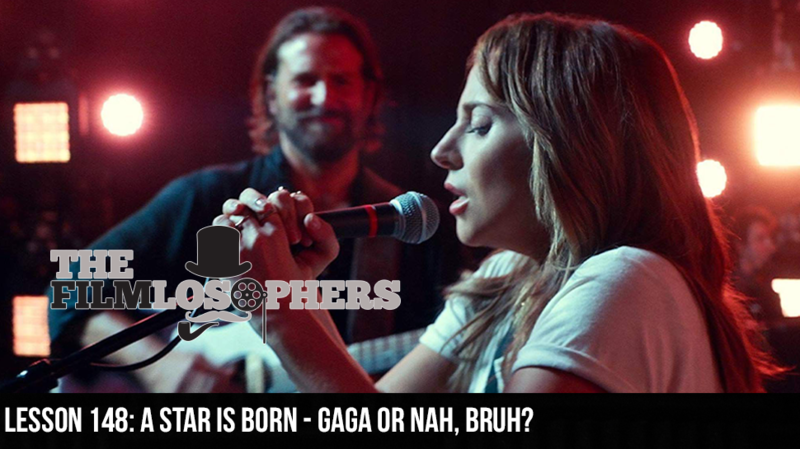 Lesson 148: A Star is Born – Gaga or Nah, Bruh? The Filmlosophers, Eddie Villanueva, Chad Riley and Spencer Williams, get a little bit shallow with this week’s review of A Star is Born (2018). As the fourth iteration of this particular storyline, the Oscar-nominated film modernizes the tale of an aging and substance-abusing musician who discovers a new talent and helps to launch her professional career. Directed by and starring Bradley Cooper, the film also stars Lady Gaga, Andrew Dice Clay, Dave Chappelle, and Sam Elliott. As one of this year’s most highly publicized awards contenders, A Star is Born has already raked in more than 180 nominations from a variety of sources in multiple categories. It’s also a commercial success, with nearly $208 million in domestic tickets sales. So why didn’t it earn top marks from our team? Listen and find out!